The elements of the matrices from the operator , called the impulse response, can be interpreted as the impact that a shock in one variable has on another variable. Let be the element of at lag j, where i is the index for the impulse variable, and n is the index for the response variable (impulse response). For instance, is an impulse response to , and is an impulse response to . The accumulated impulse response function is the cumulative sum of the impulse response function, . The elements of the matrices , called the orthogonal impulse response, can be interpreted as the effects of the components of the standardized shock process on the process at lag j. The coefficient matrix from the transfer function operator can be interpreted as the effects that changes in the exogenous variables have on the output variable at lag j; it is called an impulse response matrix in the transfer function. The accumulated impulse response in the transfer function is the cumulative sum of the impulse response in the transfer function, . The asymptotic distributions of the impulse functions can be seen in the section VAR and VARX Modeling. 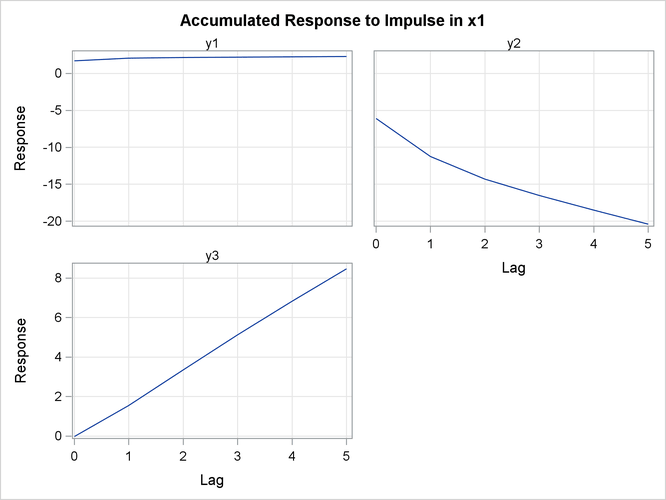 The following statements provide the impulse response and the accumulated impulse response in the transfer function for a VARX(1,0) model. In Figure 35.26, the variables and are impulses and the variables , , and are responses. You can read the table matching the pairs of such as , , , , , and . In the pair of , you can see the long-run responses of to an impulse in (the values are 1.69281, 0.35399, 0.09090, and so on for lag 0, lag 1, lag 2, and so on, respectively). Figure 35.27 shows the responses of , , and to a forecast error impulse in . Figure 35.28 shows the accumulated impulse response in transfer function. Figure 35.29 shows the accumulated responses of , , and to a forecast error impulse in . 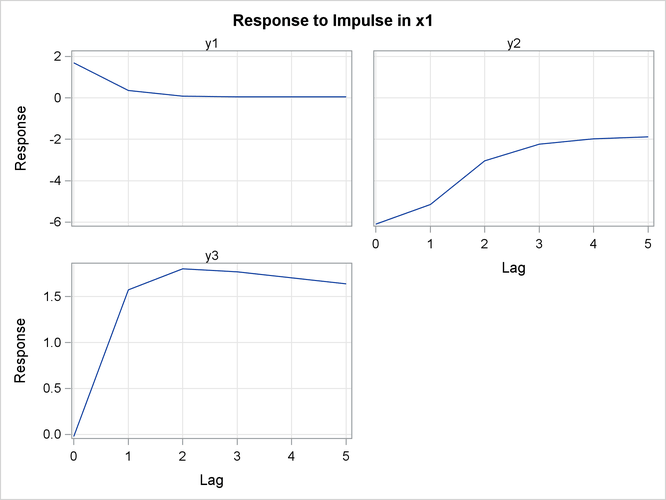 The following statements provide the impulse response function, the accumulated impulse response function, and the orthogonalized impulse response function with their standard errors for a VAR(1) model. Parts of the VARMAX procedure output are shown in Figure 35.30, Figure 35.32, and Figure 35.34. Figure 35.30 is the output in a univariate format associated with the PRINT=(IMPULSE=) option for the impulse response function. The keyword STD stands for the standard errors of the elements. The matrix in terms of the lag 0 does not print since it is the identity. In Figure 35.30, the variables and of the first row are impulses, and the variables and of the first column are responses. You can read the table matching the pairs, such as , , , and . For example, in the pair of at lag 3, the response is 0.8055. This represents the impact on y1 of one-unit change in after 3 periods. As the lag gets higher, you can see the long-run responses of to an impulse in itself. 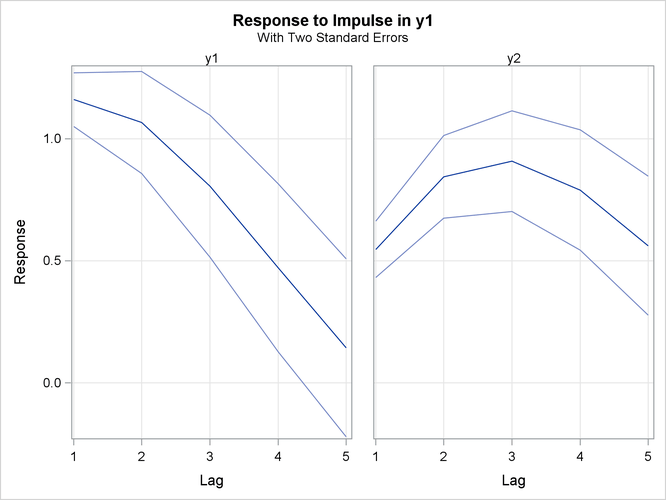 Figure 35.31 shows the responses of and to a forecast error impulse in with two standard errors. Figure 35.32 is the output in a univariate format associated with the PRINT=(IMPULSE=) option for the accumulated impulse response function. The matrix in terms of the lag 0 does not print since it is the identity. 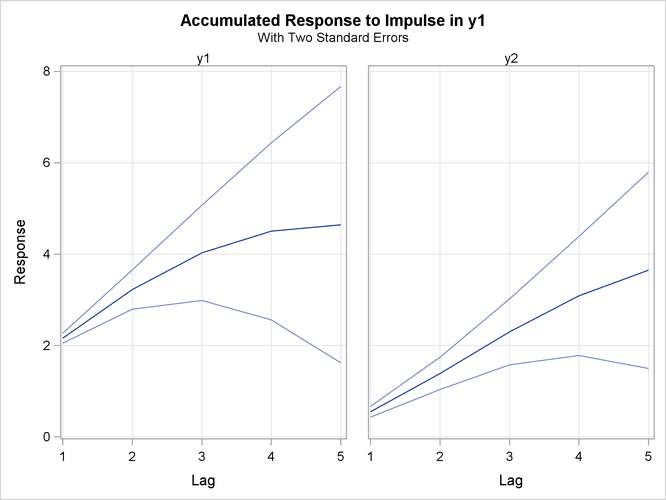 Figure 35.33 shows the accumulated responses of and to a forecast error impulse in with two standard errors. Figure 35.34 is the output in a univariate format associated with the PRINT=(IMPULSE=) option for the orthogonalized impulse response function. The two right-hand side columns, and , represent the and variables. These are the impulses variables. The left-hand side column contains responses variables, and . You can read the table by matching the pairs such as , , , and . In Figure 35.4, there is a positive correlation between and . Therefore, shock in can be accompanied by a shock in in the same period. For example, in the pair of , you can see the long-run responses of to an impulse in . 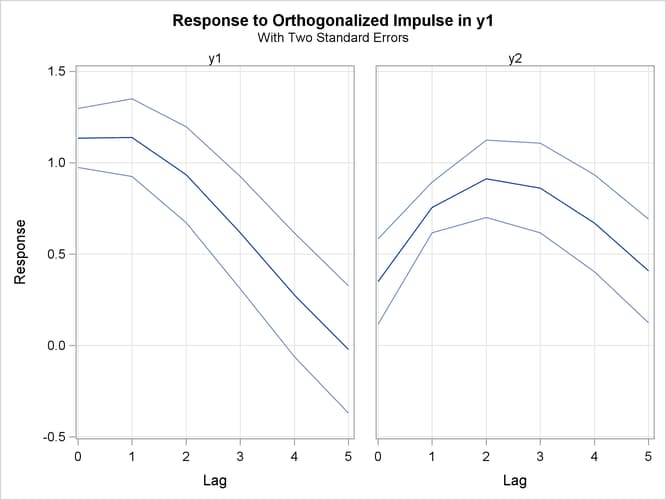 Figure 35.35 shows the orthogonalized responses of and to a forecast error impulse in with two standard errors.